When a domestic water system is drained of its water, air fills that void. 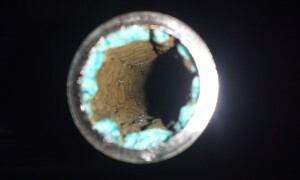 The turbulence of re-filling the pipes and displacement of the air loosens the debris that has accumulated around the inside of the pipes over time. The loosened debris can easily clog up the grid strainer at your faucets. Sometimes the kitchen pull down or pull out head can be so clogged that the head has to be replaced. A useful tip: Remove the spray head on your kitchen pull down or pull out head or on a standard faucet unscrew the aerator. Then purge all of the air and water out of the hose until a steady stream of water comes out. During this process there may be water and air spraying out causing a bit of a mess that will need to be wiped up. So, especially when purging air out of a fixture in a small sink, cup your hands around the water/air being purged out so it doesn’t spray all over the place and make a mess. 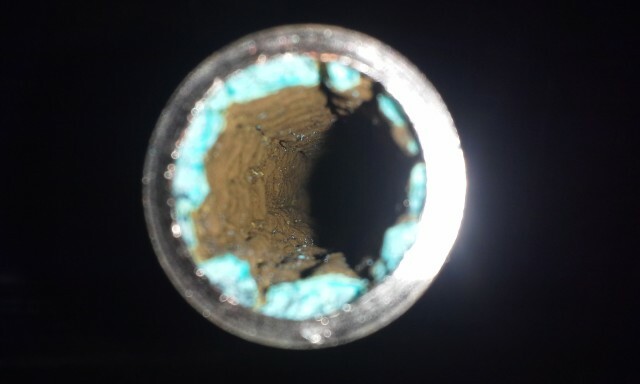 The above photo is of a 3/4″ water main from a house I worked in. This section of pipe I replaced with new.